If you're studying North Africa with your students or just want to expose your children to some of the beautiful creations of this culture, consider trying these crafts from Morocco for kids. Located between the Middle East and the African mainland, Morocco has been an important independent state since at least 110 BC. Over the years, various countries have controlled the area, leading to great cultural diversity and some amazing traditional crafts. Some of the most significant Moroccan crafts include jewelry, belts, woven rugs, ceramics, drums, and lamps. While many of these crafts feature elaborate workmanship and precious materials, kids can make simple versions of these beautiful projects. When studying Africa, it can be difficult for children to envision the people and places they read about in their textbooks. Crafts can be the perfect way to connect kids to the beauty and excitement of the Moroccan culture. Many of these crafts include small parts, so they may not be suitable for very young children. If possible, have all of your materials ready before you begin the project. Kids hate waiting while you look for the glue or scissors. Keep crafting sessions short to retain kids' interest. A craft should take no more than 15 to 30 minutes. Music and dancing are very important to the culture of Morocco, and belly dancing is one of the most popular pastimes in this area of the world. Not all belly dancers wear anklets with bells on them, but it's common to see this type of jewelry. Kids can make their own jingle anklets and experiment with how the jewelry makes music as they walk around. Each child should measure his or her ankle with the measuring tape. Add two inches to this measurement, then cut the elastic trim to this length. Place a small binder clip on the end of the elastic to keep the bells from sliding off. String the elastic through the hole in each bell. Remove the binder clip and tie the two ends together. Cut the colored ribbon into short lengths. Tie these in between the bells. Mosaic tile designs figure heavily into Moroccan architecture. These beautiful creations grace the floors and walls of large buildings and individual homes. Kids can make their own mosaic creations with a simple stepping stone kit, which is available at your local craft store. This craft is best for older children, but it's still a good idea for adults to handle mixing up the concrete. Stir together the concrete mix and water according to the package directions. Pour the concrete into the stepping stone molds, and allow to settle for a few moments. Gently place the glass marbles on the surface of the concrete, jiggling them slightly to remove any trapped air. Allow the concrete to cure according to the directions. Decoupage brightly colored tissue paper squares onto plain glass votive holders for a mosaic effect. Make a multi-stranded beaded necklace out of bright wooden beads. Create pretty artwork by making henna tattoo-inspired designs on plain cardstock. Weave colorful strips of cloth to make a trivet inspired by a Moroccan rug. Make a friendship bracelet with embroidery floss in red, green, and black, the colors of the Moroccan flag. 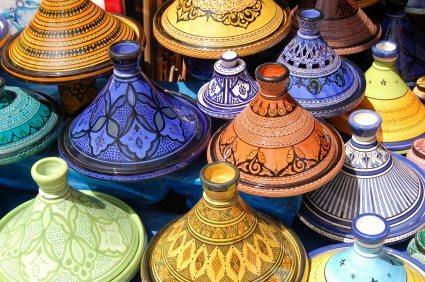 Regardless of which Moroccan craft you choose, kids will have fun learning about this inspiring and creative culture.